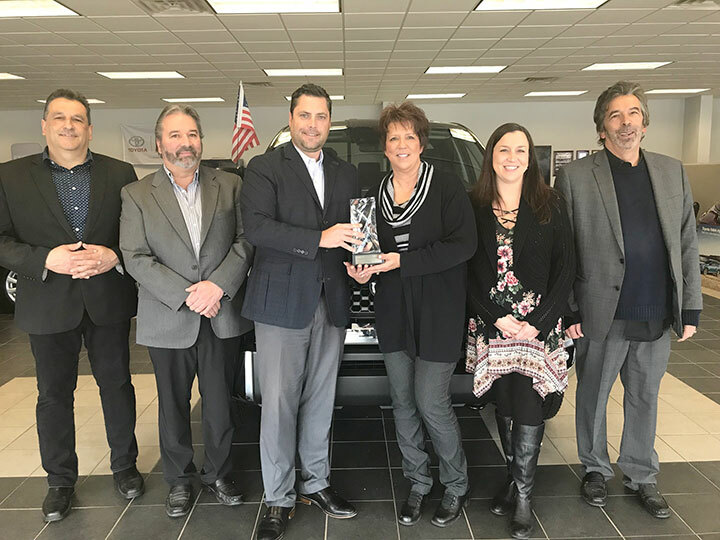 Kim Fox, center, the dealer principal of Bergeron Toyota in Iron Mountain, receives a 50-year anniversary award from Sam Wintermyer, Toyota Cincinnati Region general manager. Also in the photo are family members who operate the business: Adrian Bergeron Jr., left; Scott Bergeron, second from left; Nicole Fox Wender, second from right and Fox’s daughter; and Brian Bergeron, right. Bergeron Toyota was started by the late Adrian Bergeron. The dealership now is operated by his four children. The award celebrates the dealer’s commitment to Toyota and the community.